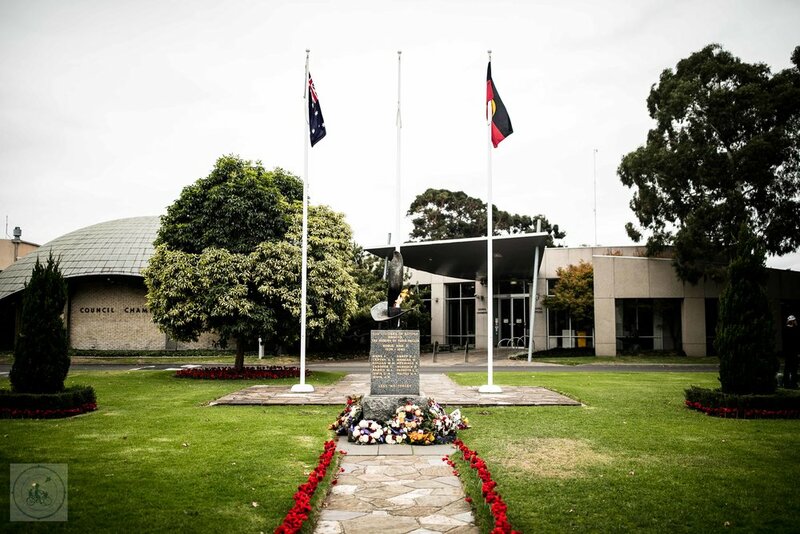 The Newport RSL will be holding a March and Commemorative Service to mark Anzac Day. The March will leave the Newport RSL in Market St at 1.00pm, then proceed along Market St, Mason St and Mirls St to the Cenotaph in Mason St.
From 1:45pm there will be a Commemorative Service including the laying of wreaths. The marchers will then return to the RSL via Market St.
As a result of the above the following road closures will be in place around these times. Traffic diversions will be in place. March : 5.30am Step Off Point is Altona RSL, 31 Sargood Street, Altona, following the March refreshments will be provided at the RSL. Following the service, breakfast will be served at the Kelly Park Community Centre. Contact the Werribee RSL for further detail on 9741 5525. Please note that road closures will be in place. Breakfast : Breakfast will be available following the Dawn Service at 6.15am. (a Gold Coin Donation is kindly requested) Breakfast will be in the Public Hall. Melton War Memorial, High Street, Melton. (a Gold Coin Donation is kindly requested) Breakfast will be at the Melton Country Club. March : 9.30am Step Off Point is Alexandra Street, Melton, following the March refreshments will be provided at the Melton Country Club. Commemoration Service : 9:45am – Melton War Memorial. 6am Dawn Service - It is recommended to assemble on the Shrine Forecourt by 4.30am, no requirement to register attendance. Pre-amble address will commence at 5.45am prior to the Service at 6am. There is no seating available. The Dawn Service concludes at approximately 6.30am, attendees are encouraged to enter the Sanctuary to lay poppies following the conclusion of the service. Invited guests assemble at 7.45am in the Sanctuary. Thousands of veterans, their descendants and current serving personnel will march down St Kilda Road, starting at the intersection of Flinders and Swanston Streets and concluding at the Shrine of Remembrance. Unit wreaths will be laid at the Shrine progressively during the March which will conclude at approximately 1pm. What is open and where can we go? What is open and where can we go on Good Friday? Saturday in Melbourne's West. We have you covered for family fun! HOPPY EASTER! We hope you have a great day with the family. What is open and where can we go on Easter Monday! Hands up who likes chocolate? Oh, who doesn't like chocolate! Easter time is a great excuse to indulge in some yummy choccie treats and don't forget it's hot cross bun time too. Mamma has a few events and ideas here for you to enjoy and even a couple of spots where you can pick up some of the most delicious Hot Cross Buns in the West. Whatever your treat of choice is, enjoy this special time with your family and friends. You and the family can use this handy one pager to work your way through some great events, holiday programs and fun happenings throughout the holidays. mamma's melbourne wide - pick your own - guide! Fruit picking is hands down one of Mamma’s FAVOURITE family adventures! We love coming home with our collection after a fun day out and we all seem to appreciate our food just a little bit more when we have gathered it ourselves. Money might not grow on trees, but treasure definitely does! Need some quick inspiration for where to take the family for adventure? Well, Mamma says look no further. Here are the most popular articles on www.mammaknowswest.com.au for 2018! Need some quick inspiration for where to take the family for a play? Well, Mamma says look no further. Here are the most popular westie playgrounds on www.mammaknowswest.com.au for 2018! Need some quick inspiration for where to take the family for an adventure? Well, Mamma says look no further. Here are the most popular westie adventures on www.mammaknowswest.com.au for 2018! Need some quick inspiration for where to take the family for a bite? Well, Mamma says look no further. Here are the most popular westie eats ( and some drinks) on www.mammaknowswest.com.au for 2018! When the weather is fine (even when it isn't!) Mamma is a huge fan of some of the beautiful gardens and outdoors spots to hang with the family and so we have pooled our resources with the other Mamma's and put together a mighty fine list of fab gardens for you to visit! Get ready to pack a picnic and enjoy! Ballarat is filled with fun for the whole family - Mamma and the crew spend a fair bit of time in this neck of the woods and it's only fair we share with you all some of our fave things to do and places to go.